We bought a lot of these from a general store which was closed during the early 1990´s economic depression. Some of the plastic bags were ruptured in storage, and we decided to sell these separately. 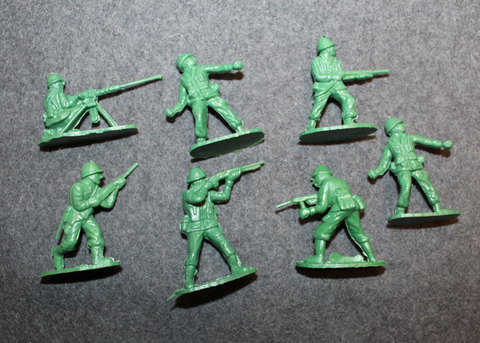 There is about 10 different models, soldiers look like a axis-allied mixture of korean war participants. The label has it right, Great Attack. These are exactly those 40mm high green ones, that were burned, maimed, blasted to pieces with all kinds of fireworks, tools, and other toys, between the sandbox era 1960-1990. Full bags are also available. Finnish Army, traffic paddle. No passing.